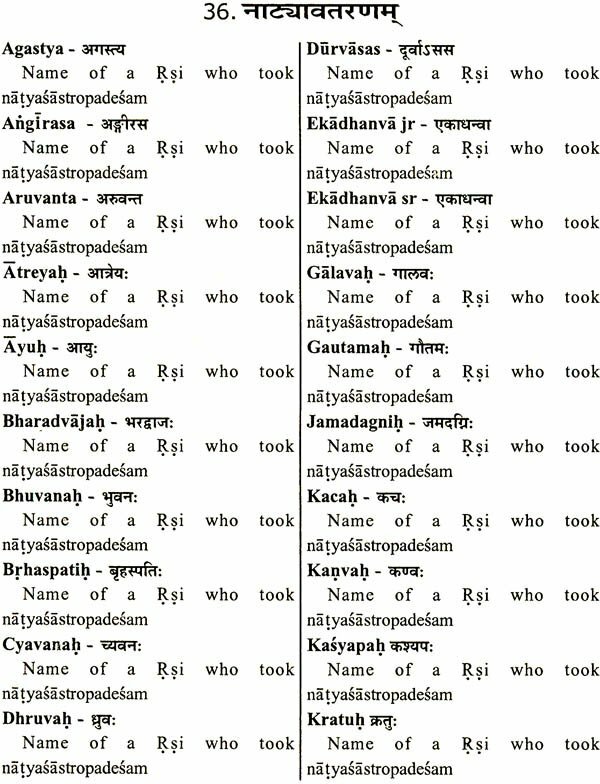 As the very title of this book suggests this is an exhautive glossary of all the Technical Terms found in the 36 Chapters of The Natyasastra of Sage Bharata. The following are the salient features of this unique research work. 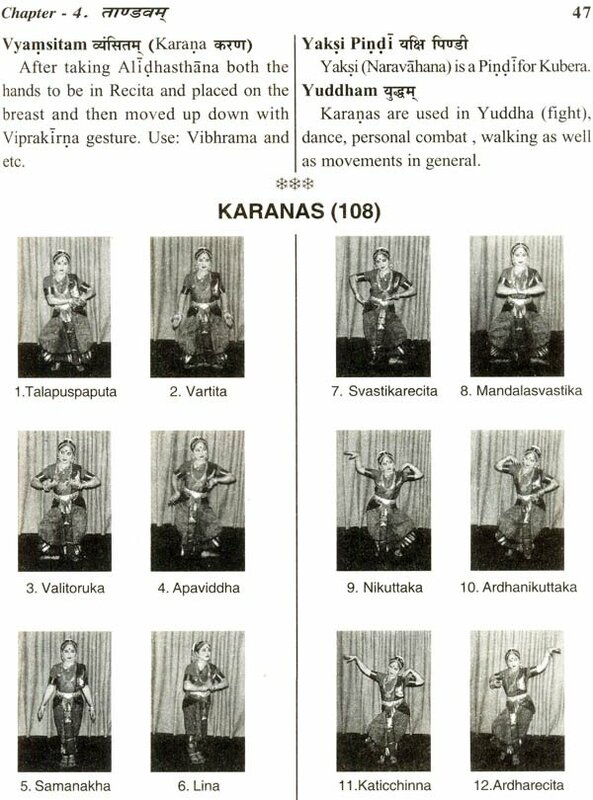 Another important feature of this book is that necessary photo-illustrations for 108 Karanas and other Hasta - abhinaya aspects which are efficiently and effectively demonstrated by the author by herself. All the description is given in English Language. 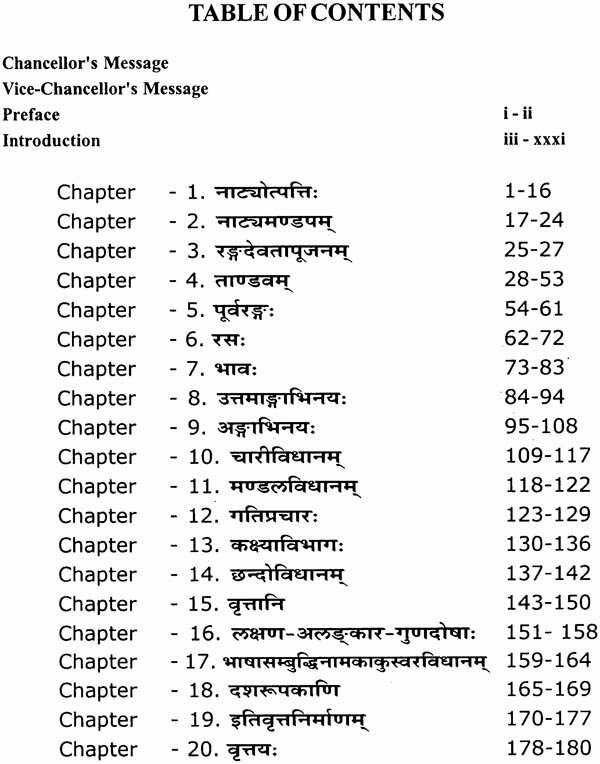 Necessary derivative explanations were presented in Sanskrit. This text will surely be useful for all the students of classical dance forms of India. Even researchers can use this book as a reference source. Mrs. N.A. Laxmi. The Director of Bharata Kala Kendra, Chennai, is a well-accomplished exponent in Bharatanatyam and Kucipudi schools of Indian Art of Classical Dance. Initiated to Dance at the very tender age of three, gradually in an ascending line she could maintain a good and impressive record of stages of lasting success in her field. She obtained the Diploma in Bharatanatyam from The Department of Education, Andhra pradesh. She received, Master of Performing Arts (MPA), A Masters Degree from The University of Hyderabad in 1994. She has received Senior Research Fellowship for two years from The Ministry of Culture. Government of India for two years for her outstanding research on Bharata’s Natyasastra. As a Dancer, as a singer, as a choreographer and as a music composer her three and half decades’ experience eamed her a great fame and name in the field of Indian Dance. Sabarimoksam, Naukacaritam, Annayya Gancina Krsnudu, Sajiva Silpam and Visala Bharati are some of the Master Pieces of Dance Choreographed by her. To her credit she has attended the most prestigious dance festivals of our country and abroad such as XI World Festival of Youth and Students (Cuba 1978) Golden Jubilee Celebrations of Andhra University 1978, Festival of Performing Arts and Literature (Jabalpur), Konark festivals at Konark and Bubhaneswar in 1990 and so on. Apart from all these Mrs. Laxmi is a B ‘High’ light music vocal artist in All India Radio and Television. Her constant pursuits in the field of Dance as a researcher are ever progressive on manifold subjects which received a lot of appreciation from scholarly circles being much useful to the student generations. Natya Sastra of the Celebrated Sage Bharata occupies a unique place among the world-class treatises in the field of Theatre of Arts. Particularly in the History of Ancient Indian Sanskrit Literature it is equivocally proclaimed as the pioneering, prolific and profound text on the subject of Dramaturgy. Through many centuries it has been studied by the scholars with great respect, devotion and attention as the spring fountain of multidisciplinary knowledge in the areas of Dance, Music, Aesthetics and Poetics. A plethora of writings have been produced through generations in appreciation of this text and also to annotate for a better understanding of this text. 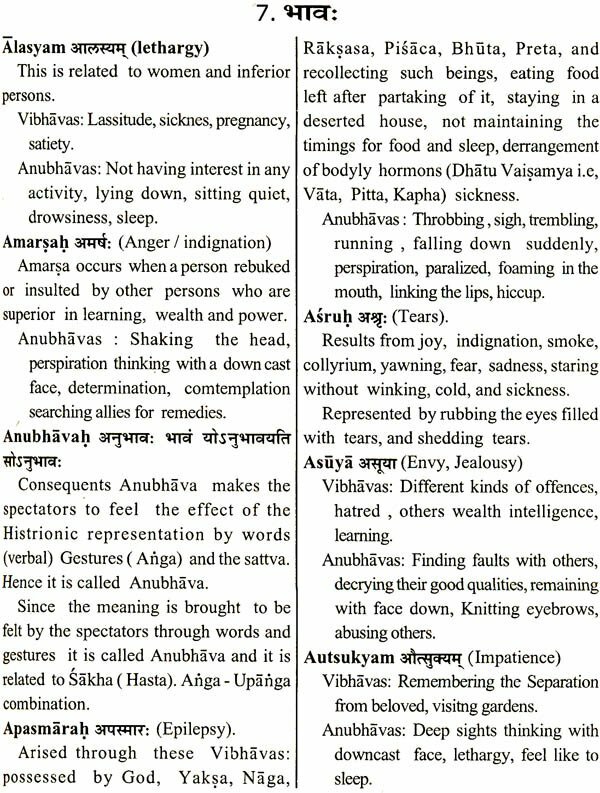 ‘A Pictorial and Descriptive Glossary of Bharata’s Natyasastra (A. Students ‘Companion) ‘is one such noteworthy writing produced in the modem times by Smt. N.A. Laxmi keeping in view the needs of the students of Indian Classical Dance whoever are enthusiastic to get a thorough understanding of Bharata’s Natyasastra. The need of good knowledge of technical terms in an inevitable aid to procure good knowledge of any discipline of learning and so also of Natyasastra. 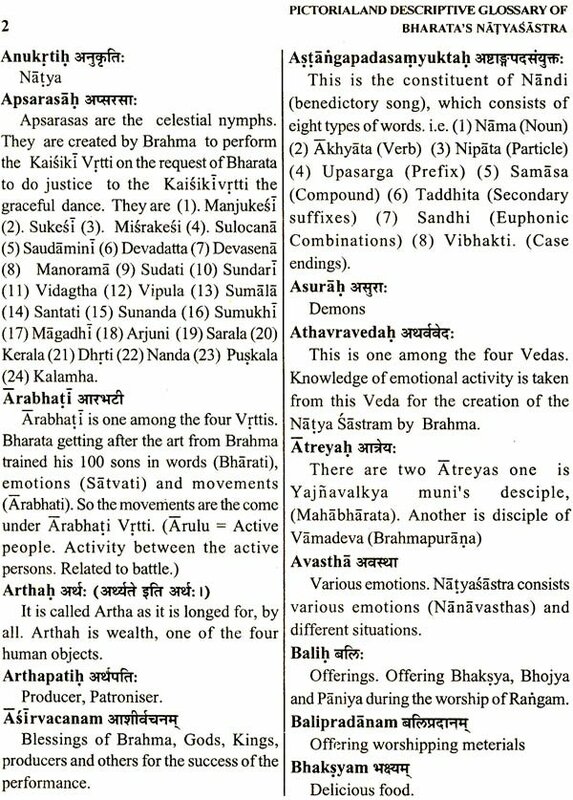 Present work gives us all required information of all the technical terms of Natyasastra in the form of Descriptive Glossary arranged chapter wise along with photo illustrations of 108 Karanas, Samyuta hastas, Asamyuta hastas etc., given occasionally. Besides this all possible flowcharts and matrices are given at the end of the text from all its 36 chapters for the convenience of learners. Smt. N.A. Laxmi is a scholarly dancer of Bharatanatyam with a good traditional background. She has an unequaled knowledge of various traditions of Indian Classical Dance. She is an enthralling choreographer with commitment to protect the principles of Natyasastra presenting in a very appealing manner. Besides this she has equally laudable command over the Science of the Ragas of Karnatak Music. It is sure that the present work from such an eminent scholar and expert dancer will be of a great help to the students of future generations. 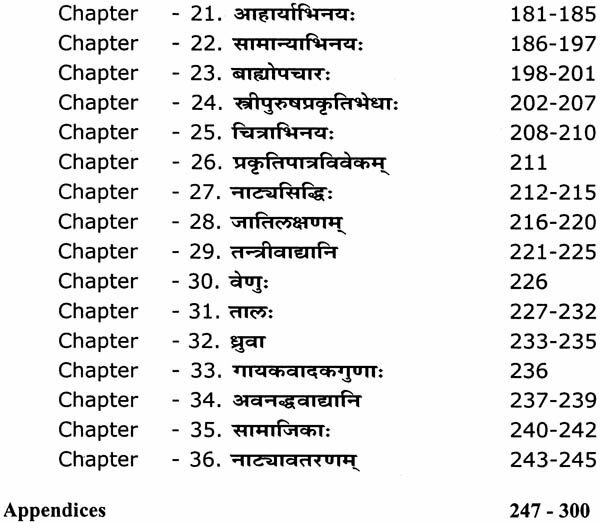 It gives me immense pleasure to find this as a number in the Golden Jubilee Publication Series of our Rashtriya Sanskrit Vidyapeetha, Tirupati. I wish that this will receive the appreciation of the Scholarly world meeting the needs of future student generations. The term glossary as the dictionaries define does mean a list of difficult, technical or foreign terms with definitions or translations, as for a particular author, subject, book etc, Glossaries in any or every stream of knowledge are of a great use in understanding any particular subject thoroughly. They help in understanding the technicality of a subject as alphabet does in learning and understanding a language. 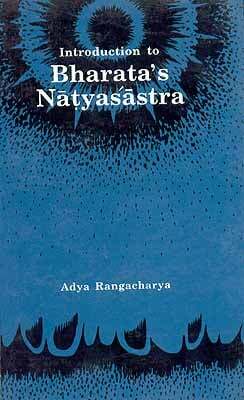 Natyasastra of the sage Bharata is earliest available text on Indian dance and dramaturgy. Every student of Indian traditional dance devotedly studies the Natyasastra. There has been a long felt need of preparing a glossary for Natyasastra particularly for the benefit of the student generations in spite of the several voluminous and analytical works critical editions and commentaries existing on Natyasastra. Hence this attempt has assumed a desired shape with the kind and generous gesture of the ministry of culture Government of India. There are certain special features in this Glossary. 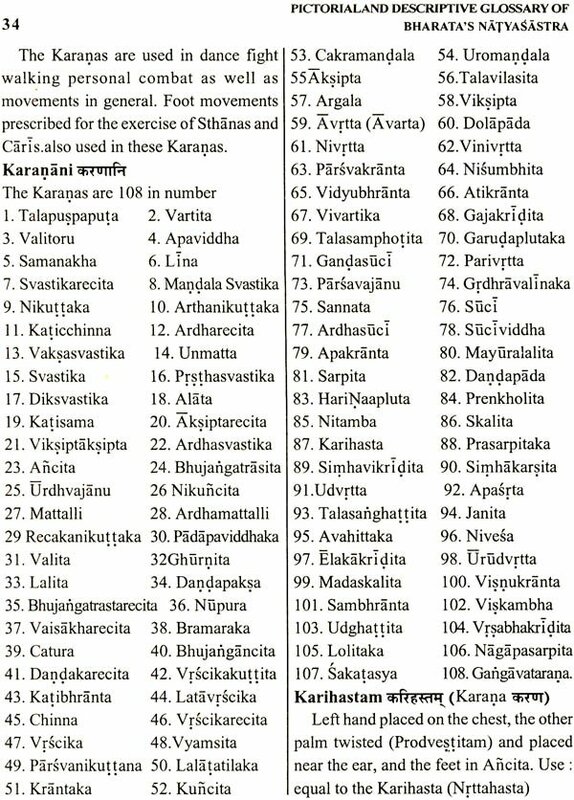 a) This glossary is supplemented with several pictures particularly of 108 karanas and all Hastabhinayas with perfect postures especially for the benefit of the students. 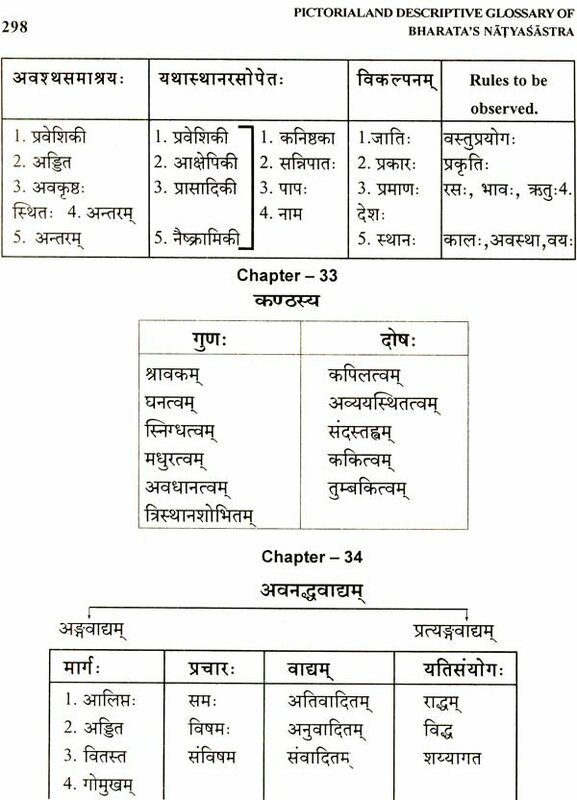 b) To avoid confusion and for an easy reference the terms in alphabetical order are given in this work in chapter wise sequence in stead of giving a grand list of the terms clubbing all the 36 chapters. This is done so in order to pull the students from a fall into the abyss of confusion. i) Introduction giving information of commentaries and critical editions of Natyasastra and the other available treatises as on Indian dance and Dramaturgy. 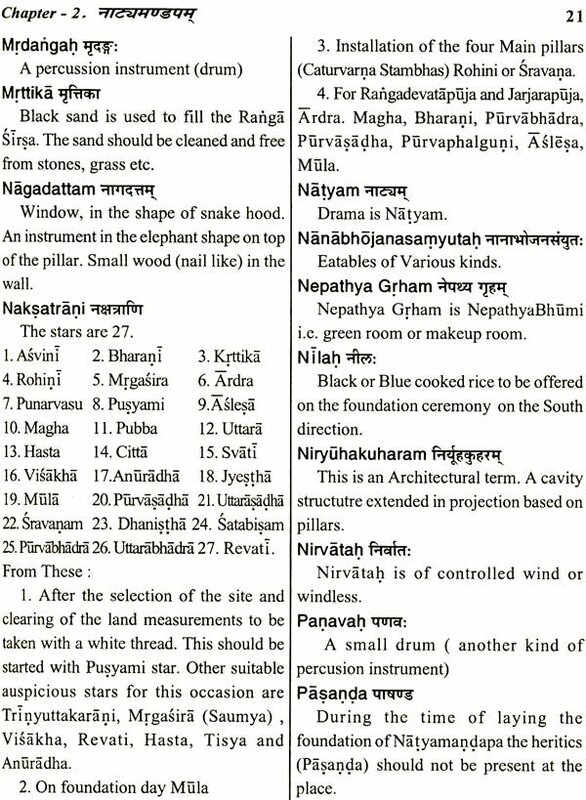 ii) Chapter wise glossary of Natyasastra. 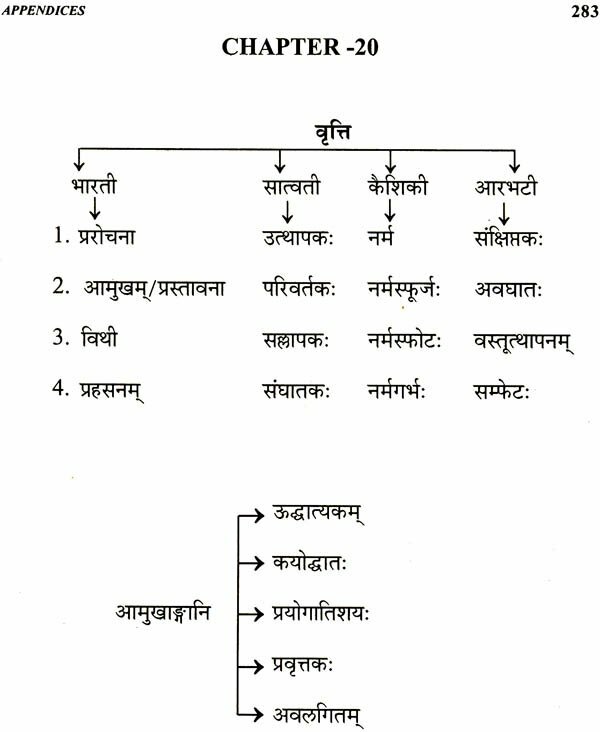 iii) Chapter wise tree charts and flow charts of the subject to the possible extent showing the scheme of Bhrata’s Categorical classification. It is the hope of the writer that this work shall satisfy the needs of the .students of the field, please the hearts of the admirers and win the blessings of the experts. 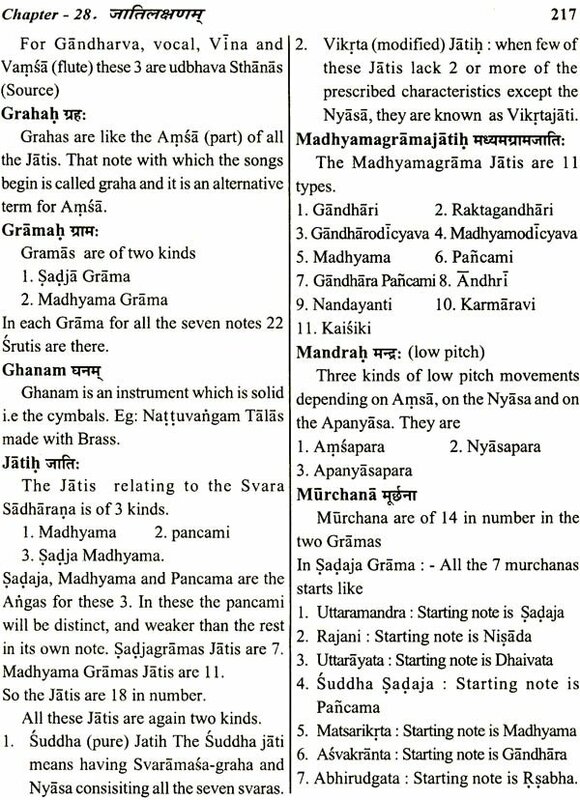 The history of theoretical literature on Indian dancing begins with the Natasutras referred to by Panini. 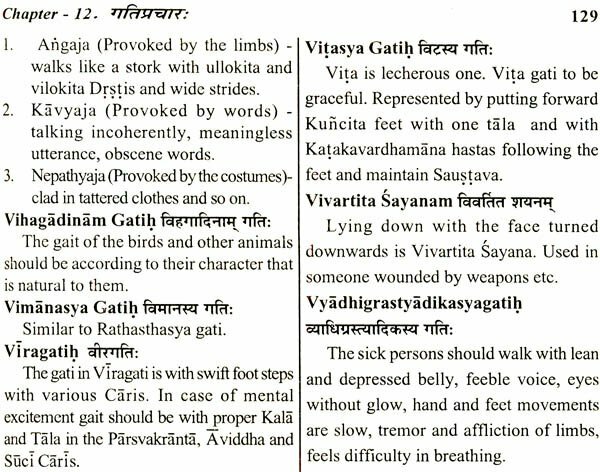 Silalin and Krusasva were the authors of these Sutras. Though we cannot determine definitely the nature of these works, it is clear that these works contained the first codification of the technique of dance and drama. It can also be established that these Sutras contained sets of rules for performing actors, dancers and pantomimists. Classical dance in India has aptly been termed a form of yoga. The content of Indian dance envelopes the religio-philosophic background as well as emotional aspect. The inter-relationship of the Indian arts is a significant and rewarding study from the point of view of both spirit and form. In the art of Indian dance different aspects of spirit and technique merge hormoniously to make a beautiful synthesis. It is significant that treatises on dance seldom discuss the technique of this art from in isolation. Both literature and music are invariably discussed. Conversely the treatises on sculpture, drama, music and painting invariably devote a portion either to dance itself or discuss certain elements of technique of these art forms. 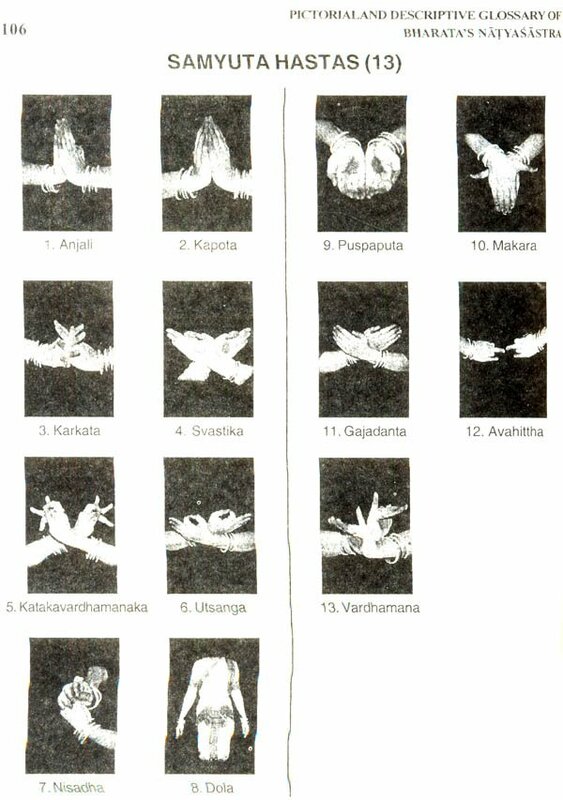 Similarly treatises on paintings discuss the rasa dristi in terms of glances of the Natayasastra. 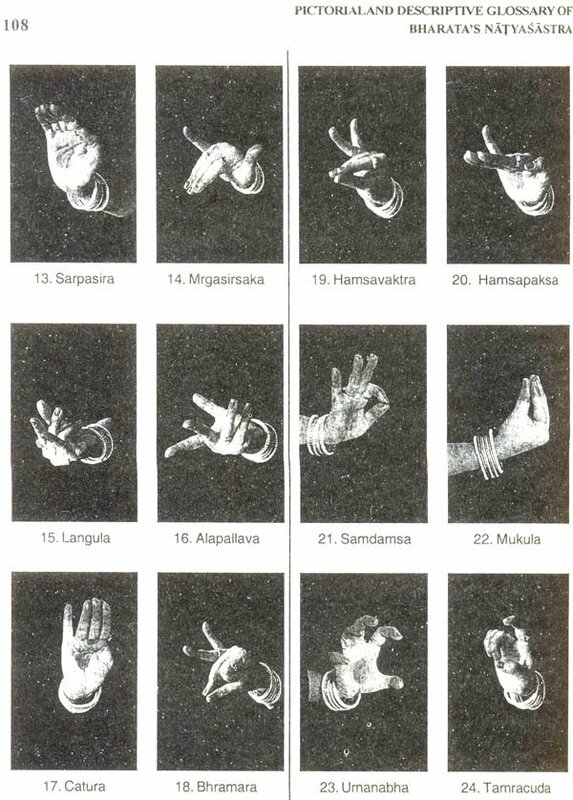 And treatises on sculpture enumerate in detail the dancing aspects of the various gods and goddesses and discuss the symbolism of the hand movements in terms of hastabhinaya of Natyasastra. This is a partial and imperfect comprehension of the important inter-relationship of the arts, which is one of the basic assumptions of classical Indian aesthetics. This integrity of all the arts is well described by the conversation between King Vajra and Markandeya in the Vishnudharmothara purana. King Vajra requests the sage to accept him as his disciple and teach him the art of Icon making. The sage replies that without the knowledge of painting one cannot learn the Icon making. The king wishes for instruction in this art and he is told that unless he is an accomplished dancer, he cannot grasp even the rudiments of painting. The king requests that he be taught dancing, the sage replies that without a sense of rhythm or a konwledge of instrumental music, proficiency in dance is impossible. Again the king requests that he be taught these subjects for which he gets the reply that a mastery of vocal music is necessary, and so finally the sage takes the king through all these stages before he is taught the art of lconography. The diverse forms of Classical dance has over the centuries proliferated, declined and revived. Though it manifests a strong foundation of physical exercise, in origin and in intension it’s a spiritual exercise. Its mainspring is Hinduism and it is filled with myths, legends, rituals and folklore. The Hindu mind views the creative process as a means of recreative a vision of a divine truth and regards art as a means of experiencing a state of bliss akin to the absolute state of ananda. Two forms of Dance: Tandava and Lasya-Dance believed to have originated with Lord Shiva. He himself a dancer par excellence and he taught his consort Parvathi, he danced the Tandava, the Tandava, the masculine form, while Parvathi did the Lasya aspect, A feminine form. Another legend explains how this celestial art came to be transmitted to the race of mortals, Usha, the beautiful daughter of the demon King Bana, an ardent devotee of Shiva, was the fortunate mortal chosen by Parvathi for instruction, in the art of dance and taught her the art of Lasya. Usha passed it to the Gollabhamas (milkmaids) of Dwaraka. They in turn taught the same to the women of Sourashtra. It is also said that Brahma, the creater was perturbed at the turmoil that prevailed on earth. He decided to create a panchamaveda that would be accessible to all. He took Pathya (the art of recitation) from the Rig Veda, Abhinaya (visual representation) from the Yajur Veda, Gita (music) from the Sama Veda and Rasa (aesthetics) from the Atharva Veda. This science of dramatic presentation was first taught by Brahma to the sage Bharata. Bharata presented his three fold art drama, music and dance to Shiva. Reminder of his own vigorous dance, Shiva ordered Tandu to instruct Tandava to Bharata. Bharata combined this art with the knowledge that he had already and wrote Natyasastra, an exhaustive treatise on the art of theatre. 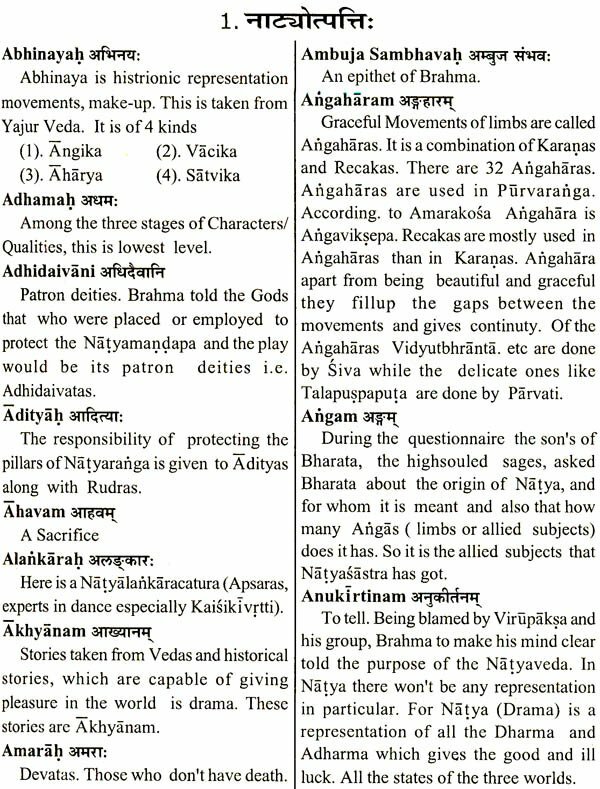 (The text of Natyasastra is the earliest extant text on dramaturgy and histrionics in which the techniques of Nrutta (dance) and Nrutya (mime) have been discussed in detail). Bharata and other sages spread this knowledge among the people of the earth. Being visible and audible, this new form brought culture within the reach of the common people. Tradition thus establishes divine link between Brahma, Shiva and people of the earth and hallows of the performing arts of dance, music and drama with a touch of divinity and immortality. To this day, the classical dance tradition of India is closely related to religion and mythology: This is reflected not only in themes chosen for interpretation, but in the manner of presentation and frequent association with ritual worship. In the Indian view of knowledge there are Sastras (Sciences) and Arts. And in Arts there are Arts for livelihood, i.e. living arts and the fine arts. Among all the [me arts Music, Dance, Sculpture and panting take main place.